The Dubare Elephant camp is located in the district of Coorg (Britannica link), now called Kodagu, in the state of Karnataka, in south India. The district of Coorg is spread over 4,100 sq kms, and comprises of three taluks: Madikeri, Somwarpet and Virajpet. A taluk (तालुक), in case you were wondering, is also called a tehsil (तैहसील), and is an administrative division, comprising of a town and surrounding villages and towns. 30 percent of the district is forest area. Its population as per 1991 census is 4,85,229, which gives it a rather sparse population density of 137 persons per square kilometer, about two-fifths of the average population density of India, which is 350 persons per sq km. Thank you very much for the geography lesson. What about the elephant camp? You can watch elephants. You can watch elephants bathe. You can bathe elephants. You can watch other people bath elephants. You can ride elephants. How about that? "The Karnataka Forest Department has about 150 Elephants in various camps and Dubare has been historically an important camp. 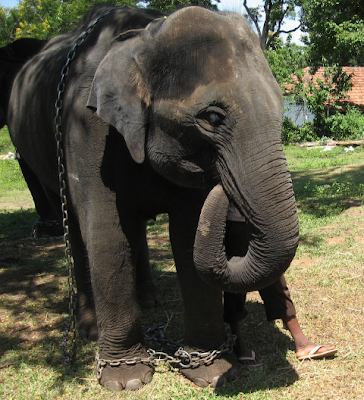 The Elephants for the famous Mysore Dassehra were trained at Dubare elephant camp. But presently after logging operations have ceased, the Forest Department does not really know what to do with all its elephants! They (elephants) have been practically retired except for giving some rides to odd tourists. At the same time, the Forest Department spends quite some money to maintain them and their mahouts. " 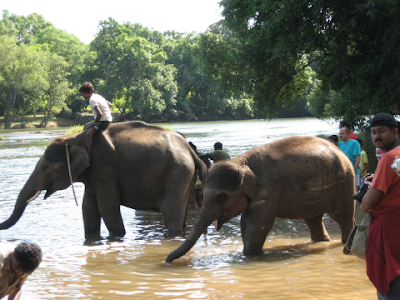 "Dubare Elephant Camp is located on the banks of River Kaveri (Cauveri) in the district of Kodagu (Coorg), Karnataka. The Karnataka Forest Department has about 150 Elephants in various camps and Dubare has been historically an important camp"
Ok, so how does one get there? Let's map it. It works for Kaplan and Norton, so it should work for us too. In the map above you can see Bangalore and Mysore. To go to Dubare, from Bangalore, you need to go towards Mysore. Actually all the way to Mysore. Basically, if you are traveling from out of Bangalore, and are flying in, then also Bangalore should serve as a good beachhead from where to make all such road trips. From Bangalore to the Dubare camp is roughly a 240 km drive, depending on where you start counting the miles from. The drive should take you between 4-6 hours, depending on what time of the day you do the drive, how fast you are willing to go, how many breaks you take, and other factors. Traveling by road, you can either waft through Mysore, catch the sights of the city, and proceed out of the city towards Dubare. Or, if you want to bypass the city, you can take the Outer Ring Road, and skirt the city completely. It saves time. The Bangalore-Mysore highway, SH17, in Srirangapatna. See the map below. Coming from Bangalore, you will most likely take the superb Bangalore-Mysore four-lane highway, SH-17. A few kilometers after Srirangapatna, which not only boasts of the 1000 year old Sri Ranganathaswamy Temple but is famous as a historical town and capital of Hyder Ali and Tipu Sultan, and just before you enter the town of Mysore, you come across a large four way intersection. You need to make a right at this intersection to take the Outer Ring Road. If confused, or lost, or just plain need to make sure you are indeed on the right path, simply stop and ask for directions. This could be a pedestrian, or a cyclist, or a chai-coffee stall owner. You will need to take at least one left turn at an intersection, and one right turn after that. You will join the highway again, or the Hunsur highway, which is a pretty good stretch of road, which should allow you to do 100kph, provided the traffic allows for it. View Larger Map Map of Mysore and surrounding area with markers for route to take. After exiting Mysore, the Hunsur highway for some 20-30 kilometers is a very well paved four-lane divided highway. You then take SH88, towards Kushalnagar, and proceed on it for some 50-60kms, and then follow the signs to the Dubare camp. As you can see, SH88 is not a divided highway, so you have to watch out for trucks and other vehicles that may decide to overtake each other, in which case you may well be staring down the barrel of a ten tonne truck hurtling down straight at you at 80kph. Apply your knowledge of school physics, especially the parts dealing with momentum (P=mV, which means that momentum is equal to the product of mass and velocity), and you would do well to avoid getting a refresher course in physics and Newton's Third Law. Otherwise the road itself is very good to allow for comfortable high speed driving. The further away from the concrete jungles you get, the lusher the greenery, the older the trees, and pleasanter the drive. This banyan tree below must be a hundred years old or thereabouts. Elephant, somewhere in the Coorg district. This is the Dubare Inn, by the Cauvery river. Across the river is the Dubare elephant camp. On the other side of the river. The Yamaha powered boats take a minute or two to cross the Cauvery river to ferry you to this side of the river. Around 9AM or so, you can see the first elephant make its way to the river, with the mahout leading him in. The elephant loves it. Drinks some water, poops a bit, and then plops into the water to bathe and simply relax. And oh yes, the appearance of the elephant is followed by the appearance of humans. Gawking humans. Indians, foreigners, adults, children, all. And even more people. And more elephants. Adult elephants, calves, all. Soon, elephants and humans are both in the river. Then the bathing begins. And the photography. And the posing. Ignore the chain. The elephants seem to. The mahouts do make it a point to give a good scrubbing down to the elephants. Which this tusker above evidently is enjoying to the fullest. Cleaning the ears is important. This is where you climb up, wait for the elephant to appear, and then climb on top of the elephant. You are taken for a short fifteen minute ride.